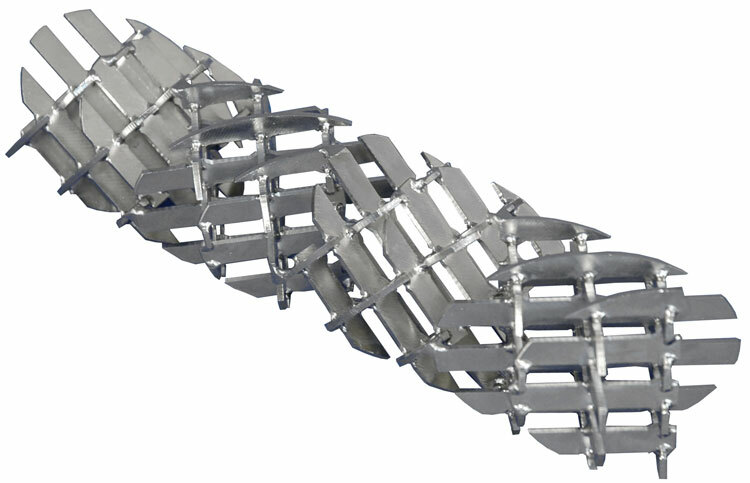 StaMixCo fabricates a wide variety of Medium & High Performance static mixing elements in metal and plastic construction which are used extensively in the food, pharmaceutical, medical, biotechnology and related life science industries. The Medium Performance static mixing elements have a characteristic feature of an open geometric structure with minimal intrusion upon the process fluids and exhibit low shear rates and low resistance to flow. . These Medium Performance designs however require long lengths to create a reasonable degree of mixing as shown in Figure #1. They are the most popular design for simple to moderate difficulty applications due to their low pressure drop and open geometric structure. 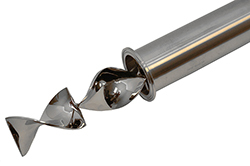 They contain highly polished surfaces suitable for Clean-in-Place (CIP) operations. 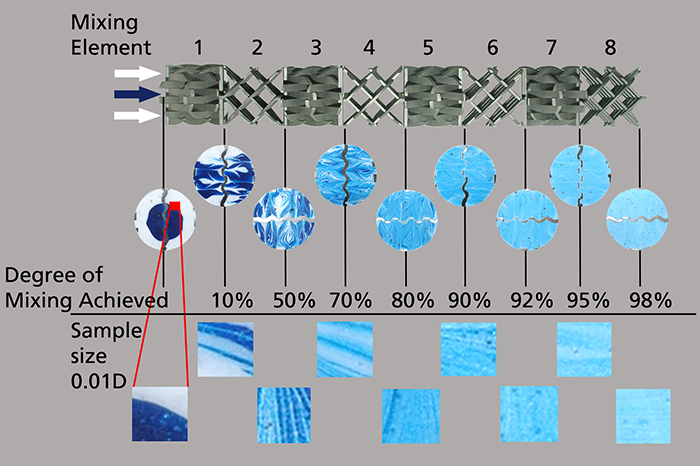 The High Performance static mixing elements have the characteristic feature of crossing bars (Type GX) or crossing corrugated plates (Type GV) which create a very high degree of mixing in a short length as shown in Figure #2: Their process performance is excellent, however they exhibit high pressure drops which often necessitates use of larger diameter mixers to minimize the impact of pressure drop. They also have a tendency to foul due to the high surface area per unit volume of their geometric structures and where the many crossing and pinch-points of the structure will cause fibrous materials and deformable solids to hang-up and foul the static mixer. 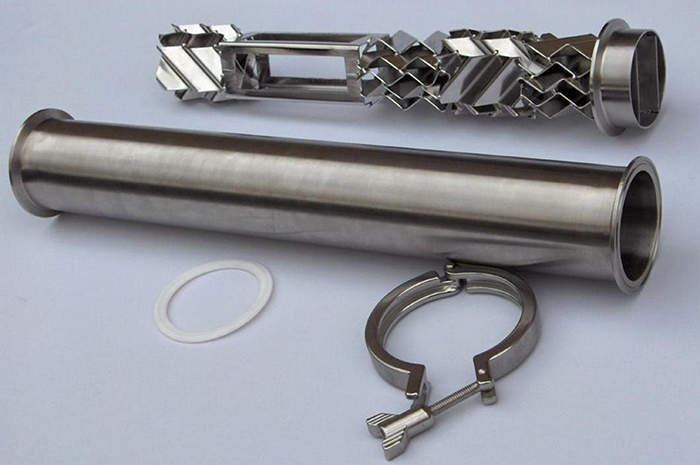 They are suitable for Clean-out-of-Place (COOP) service where Clean-in-Place (CIP) use should be limited to processing clean fluids with no large suspended solids. As with most process equipment, each design has its advantages and disadvantages where the choice of which design to install is highly dependent on the operating environment and process goals. Figure #2: High Performance Type GX mixing elements create a homogeneous mix in a short length. Figure #3: The Model HT-50 Sanitary Helical Static Mixer is supplied in 316L S/S sanitary polish finish throughout for use with Clean-in-Place (CIP) requirements in the food, pharmaceutical and life science related industries. Complete units with housings and spargers may be purchased or mixing element assemblies only for retrofit into customers’ existing piping. Units are standard stock items in sanitary tubing sizes of 1/2" – 4” diameter with shipment next day after purchase order. Figure #4: Model HT-40 Helical static mixing element assemblies are available in plastic construction in sizes as small as 1.7 mm (0.067) to 4” diameter in Polypropylene, Kynar and PTFE Teflon® construction. 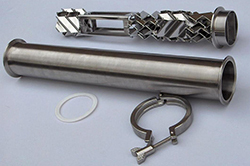 They are available as mixing element assemblies only for installation into standard plastic and metal tubing housings or custom housings supplied by StaMixCo or the customer. In some sizes, the mixing element assemblies are available in Class 6 Polypropylene construction. Most sizes are standard stock items with shipment next day after purchase order. Figure #5: The Model LT Lift Tab static mixing unit is available in various housing configurations and length of middle finger depending on the size of solids than must mix and pass through the static mixing unit without fouling. If you can gravity feed of pump material to the unit, the Type LT static mixer will mix the materials and not foul or plug. 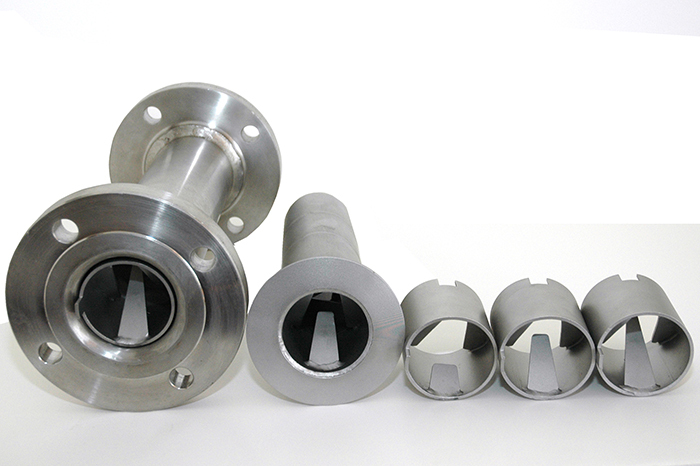 Units are available in diameters of 2” and larger in 316L S/S construction with Ferrule and process industry flanged connections and with standard and polished finish with Clean-In-Place (CIP) use capabilities. Units are custom fabricated due to the many design degrees of freedom and housing options with delivery normally 6-weeks after purchase order. The High Performance static mixing elements have the characteristic feature of Crossing Bars (Type GX) or Crossing Corrugated Plates (Type GV) which create a very high degree of mixing in a short length as shown in Figure #2: Their process performance is excellent, however they exhibit high pressure drops which often necessitates use of larger diameter mixers to minimize the impact of pressure drop. Figure #6: Type GX static mixing elements are available in sizes as small as 6.0 mm (0.236”) diameter and in much larger sizes. Polished units are 1-1/2” diameter and larger for use in CIP operations when processing clean fluids or in COOP operations when process fluids with small size solids present. Units in 316L S/S with standard surface finish are stock items where polished units are custom fabricated with 6-weeks shipment after purchase. 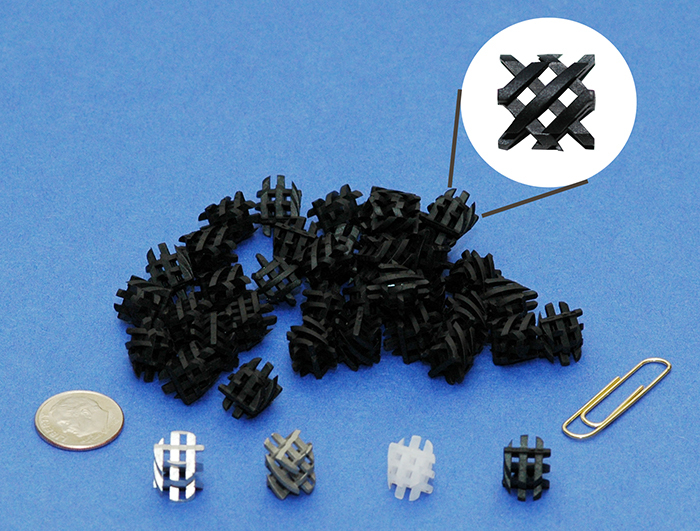 Figure #7: Type GX Injection Molded mixing elements with OD=9.3 mm (0.366”) in Polypropylene and 50% Glass-Filled Nylon Construction. 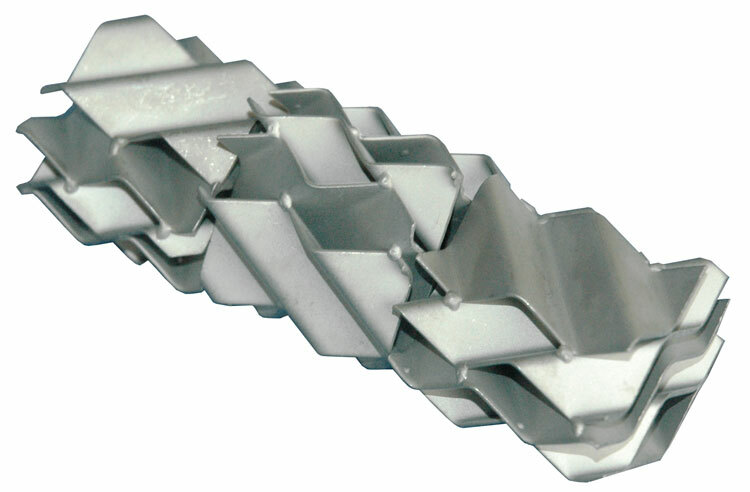 The Polypropylene mixing elements are available in Class 6 Polypropylene construction when required. Figure #8: Type GX plastic mixing elements are available in sizes 1” diameter and larger in PTFE construction. Show in photograph is a 2” diameter GX static mixer with 3-mixing element in PTFE Teflon® construction. Figure #9: Type GV static mixer with 3-mixing elements, 5-corrugated mixing plates across its diameter and a 45o corrugation angle relative to the pipe axis. Figure #10: Type GV static mixer in 2” sanitary polished construction for use as a gas-liquid contactor to enhance mass transfer to dissolve gas into the liquid.